This is a family favourite that is light and delicious, the novelty factor is that no measures of ingredients are required , it's all done in a yoghurt pot! Preheat the oven to 180°C /350°F/ Gas Mark 4. Pour the contents of the yogurt pot in a small bowl and keep the pot to measure. In a mixing bowl whisk together the eggs and two yogurt pots of caster sugar. Whisk thoroughly to obtain a light and fluffy mixture, or until a ribbon of a figure of 8 lies in the batter for a few seconds, this is easier to obtain if using an electric whisk. Next add in the natural yogurt, then a yogurt pot of vegetable oil and one yogurt pot of cornflour. Gently fold in the three yogurts pots of sieved flour and the baking powder into the mix. To finish, add the vanilla extract and half the blueberries. Grease the edges of an 8 to 9 inch round cake tin and dust lightly with some flour. Pour the yoghurt cake batter and add a few blueberries on the top, then dust with icing sugar. Bake in the oven for 30-35 minutes. Remove the cake from the tin and allow to cool on a wire rack. 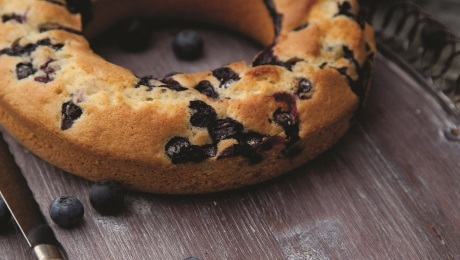 Serve with a dollop of fresh cream and blueberries.